When I was born in Flushing it was a humble, bustling lower middle-class community getting new life from two new developments: the World's Fair in Flushing Meadows Park, and Shea Stadium, also in the park, where the Mets (and the Beatles) soon would play. 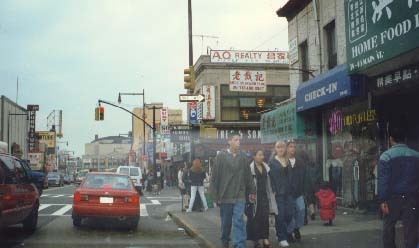 Since then Flushing has become New York's new Chinatown. The 'main' Chinatown is on the Lower East Side of Manhattan, but that one plays to the tourists. Here it's seriously Chinese. And Korean. And Afghani. And Burmese. And Thai. A few 17th Century Dutch houses still exist alongside the noodle soup shops and cheap department stores of Main Street, one of the most crowded and chaotic streets in New York City. The drivers drive according to Beijing rules: if you're passing through here on a Saturday afternoon, you might as well put your car into park -- you're going to be hanging around a long time. I was recently hit by a car on Parsons Boulevard (a couple of blocks east of Main Street), and in trying to settle the accident (a minor fender-bender, which should have been easy to settle) I was for a moment taken directly into the surreal, otherworldly heart of Flushing's Korean community. The person who hit me was a frightened 23-year-old, a waiter at a Korean restaurant who'd been in this country for a year. The accident was entirely his fault, but I made the mistake of going to his home and allowing him to call his brother and sister (and several other people, it seemed -- they spoke in Korean as I sat waiting) before making him hand over his insurance information. Half of Korean Flushing then descended upon me, it seemed. I was phoned dozens of times at home and at work, each time by a different person who'd been "asked to help." The original 23-year-old and I were suddenly in the center of a swirling vortex of activity -- I would not have been surprised to learn that news of the fender-bender was resonating through the streets of Pyongyang and Seoul, as well as those of New York. The end of the story is not nice or heartwarming: I gave in to the heartfelt pleas and entreaties and allowed my car to be taken to a Korean auto-body shop (where it would be settled with cash, no insurance). I inspected the shop and approved it -- I later discovered that immediately after I left the shop my car had been moved to another Korean auto-body shop, a much cheaper and sloppier one that I never would have approved of. Though it was necessary to replace all the damaged parts, these mechanics began trying to hammer out and repaint the parts instead, somehow imagining that I wouldn't know the difference. Fortunately, I caught them in the act (I'm not as stupid as I look), and removed my car from the premises before they got too far. I then went straight to the police, filled out the required accident report and applied for insurance (as I should have in the first place). I also went for a walk with the 23-year-old who'd originally hit me, who was now more frightened than ever, and said to him: "Despite what your brother and sister must have told you -- here in America people sometimes do things the honest way. Try it next time." I was a bit angry at first, but now that some time has passed I'm able to view this with a little more humor. I should have known, after the fortieth Korean called me on the phone, that so many people would not have gotten involved if there wasn't some scam going on. And I still remember the touching moment when the guy who hit me took me into his home and kicked his shoes off. I stood behind him -- was I supposed to kick my sneakers off as well? It seemed odd to enter a stranger's house in my socks, but I did so, and nobody in the house looked at me funny for it. I sense a future Asian Mafia brewing here in Flushing, but I'll try not to be judgmental. We all come from similar roots. What is there to say about Bayside? Houses, lots of houses. It's beyond the reach of the subway system, so Bayside doesn't really feel like city to me. One way to put it: Queens people who wish they lived in Manhattan and can't afford it live in Astoria or Jamaica or Forest Hills; Queens people who wish they lived on Long Island live in Bayside. This is Utopia Parkway near Northern Boulevard, a few blocks away from the largest Taco Bell in Queens. This is a very familiar spot to me, and will continue to be until they open a Taco Bell in Forest Hills. Also, Perry Farrell of Jane's Addiction is from Bayside. and that's about all I have to say about it. College Point is a fairly quiet, isolated corner, with a unique view of LaGuardia Airport and Shea Stadium. I have never found a college anywhere near this community. This South Flushing campus (which is nowhere near College Point) is part of the City University of New York. Jerry Seinfeld is the only famous graduate I can think of right now. 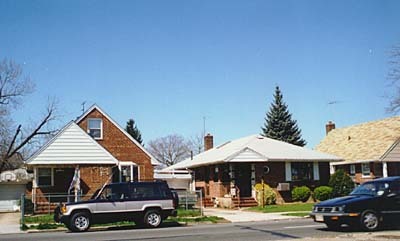 -- From "Kill Your Sons"
These are slightly fancier, more suburban and reclusive old communities to the east of Bayside. John McEnroe (hot-tempered tennis star) is from Douglaston. I don't have much else to say about this suburban corner of Queens.